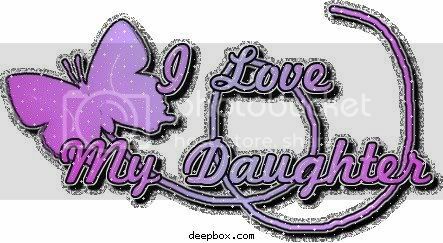 Sherrie I found this on the web and I thought of you and your mom. What a true blessing she shares to the hearts of others through the love that the 2 of you share. Norma you were in my thoughts and prayers as Thanksgiving Day came and went. I wanted to tell you how very Thankful I am for you and all that you do for us at *GP* you truly are a blessing. I hope you and your beautiful family had a wonder Thanksgiving and I hope the memories of your beautiful daughter gave comfort to you all. Jehovah blessed our lives with sure a tue blessing as Sherri and she was taken away in death so early in life. But we draw comfort knowing that we will be able to see her again in Paradise at resurrection. We look forward to the day when this old system ends and the heartackes it brings and we are together with our loved ones. Until then her thoughts and memories will be with us always. S-strong, my girl was always so damn strong! E-enlightened, she was always so enlightened, even in her darker times of sadness and sorrow. R-rare, Sherrie's personality of an old soul is rare. R-right, yes Sherrie you are always right! I- insightful, she was indeed. did not choose. May God bless and comfort you always. Thinking of you today on your angelversary in heaven. May God Bless you and know that you are missed so much here. Don't Forget to send those signs and love and kisses to your Mom. You have helped me so much along my journey and I just want you to know that I appreciate you being here for me. May God bless you abundantly. A mother should never outlive her child. I hold this song so dear to my heart because Sherrie liked it and wanted me to remember it, not only do I remember, but I try to live it, in honor of my daughter who died too soon. As her last wish, I stay very close to the lyrics of this song, a child, should outlive their parents, not the parents outlive their child. I finally found your page after Stephanie told me you had one. I know I talk to you almost every night when I pray but this is just a little something more. 7 years have passed and there has not been one event that has occurred in my life where you have not been thought of. One very recent event has been my graduation from college. I was very scared about this happening... it means I'm officially "grown up" however everytime I feel sad, angry, alone, or worried I listen to your song, "I hope you dance" because I know if you were here that's exactly what you would tell me to make me feel better and knowing that has gotten me through a lot of things. I thank God that you were a part of my life and will always be in my heart, pushing me, motivating me to work hard and do what I need to do to be happy. Thank you for pushing me so much and helping me to learn that I must push myself to get what I want and not to settle for what others want. Lastly thank you for teaching me that "it is better to have loved and lost then to never have loved at all." I was always scared to let people in, fearing that I would lose contact or just grow apart but I now know that whether I may not speak to those people anymore, they have contributed to my life one way or another. Also, if I would not have learned this from you I would never be with my boyfriend now of 6 years. I was scared to give him a chance thinking how much it would hurt to lose him but look how far we have come. Thank you. I cannot thank you enough for all that you have taught me and what a wonderful friend you have always been. You will always be the best best friend I will ever have. Forever, and even stronger from the otherside. Love is a miracle for me. Sherrie was a beautiful girl, and it sounds as she grown up very smart and decent also. I am honoured to know her mother Norma, and it sounds as Sherrie was growing up to be just as beautiful and kind as she is. I am very sorry for the loss of this very special girl to your family. My thoughts are to you, always. Have you been contacted by a loved one who has died? After-death communication (ADC) is probably as old as mankind, but ours is the first complete research study of this field. These spiritual experiences are extremely common, and in many other parts of the world they are discussed openly and freely. Between 1988 & 1995, we interviewed 2,000 people who live in all fifty American states and the ten Canadian provinces. Ranging in age from children to the elderly, they represent diverse social, educational, economic, occupational, and religious backgrounds. We conservatively estimate that at least 50 million Americans, or 20% of the population, have had one or more ADC experiences – and the actual numbers may be closer to double these figures! We collected more than 3,300 firsthand accounts of ADCs from people who have been contacted by a deceased family member or friend. These are spontaneous and direct communications that may occur anytime and anywhere, but no third parties such as psychics, mediums, hypnotists, or devices of any kind are involved. Sensing A Presence: This is the most common form of contact. But many people discount these experiences, thinking, "Oh, I’m just imagining this." It’s a distinct feeling that your loved one is nearby, even though he or she can’t be seen or heard. Though most often felt during the days and weeks immediately after the death, you may sense his or her presence months and even years later. Visual Experiences: There are a wide variety of visual experiences, which we have divided into two broad categories: partial visual and full visual ADCs. Appearances range from "a transparent mist" to "absolutely solid" with many gradations in between. You may see only the head and shoulders of your relative or friend, or someone you love may make a full appearance to you, and you will see the entire body as well, which will appear completely solid. Some visual ADCs occur in the bedroom, next to or at the foot of the bed. Others may happen anywhere – indoors or outdoors – even in a car or aboard a plane. Typically he or she will be expressing love and well-being with a radiant smile. Loved ones virtually always appear healed and whole regardless of their cause of death. Verbal communication may take place, but not always. Visions: You may see an image of a deceased loved one in a "picture" that is either two-dimensional and flat or three-dimensional like a hologram. It’s like seeing a 35 mm slide or a movie suspended in the air. Visions are usually in radiant colors and may be seen externally with your eyes open or internally in your mind. Communication may occur, especially during meditation. ADC Experiences While Asleep: Sleep-state ADCs are much more vivid, intense, colorful, and real than dreams. They are very common. Both one-way and two-way communications are typical. You usually feel your loved one is with you in person – that you’re having an actual visit together. These experiences are not jumbled, filled with symbols, or fragmented the way dreams are. Sleep-state ADCs are similar to those that occur when you are wide awake. Your relative or friend can come to you more easily, however, when you are relaxed, open, and receptive, such as while you are in the alpha state or asleep. Out-Of-Body ADCs: These may occur while you are asleep or in a meditative state. They are dramatic experiences during which you leave your body and often visit your loved one at the place or level where he or she exists. These are extremely vivid, intense, and real – some say, "more real than physical life." The environments usually contain beautiful flowers and butterflies, colorful bushes and trees, radiant lighting, and other lovely aspects of nature – and are filled with happiness, love, and joy. Physical Phenomena: People who are bereaved often report receiving a wide variety of physical signs from their deceased relative or friend, such as: lights or lamps blinking on and off; lights, radios, televisions, stereos, and mechanical objects being turned on; photographs, pictures, and various other items being turned over or moved; and a long list of "things that go bump in the night." Symbolic ADCs: People frequently ask a Higher Power, the universe, or their deceased loved one for a sign that he or she still exists. Many receive such a sign, though it may take some time to arrive. Occasionally these signs are so subtle they may be missed, or they may be discounted as mere "coincidences." Common signs include: butterflies, rainbows, many species of birds and animals, flowers, and a variety of inanimate objects such as coins and pictures. I’m watching over you ... I’ll see you again ... I love you ... Good-bye ..."
You may be asked to give a message from your loved one to somebody else. We urge you to write down the message verbatim and to deliver it, if possible, because it may help the recipient far more than you realize. Nearly all ADCs are positive, joyful, and uplifting encounters that reduce grief, provide lasting comfort and hope, and accelerate emotional and spiritual healing. We encourage you to trust your own experiences and to accept them as being real for you. Unfortunately, some people react with fear when they have an ADC. This is usually because they are startled by the suddenness of the event, or they may have never heard of one happening to anybody else. Such people may assume they are "losing their mind and going crazy." And others find it difficult to reconcile after-death communications with their philosophical or religious beliefs. Not all people are contacted by their deceased loved ones. We don’t know for certain why some are and some aren’t, but it seems that fear, anger, and prolonged heavy grief inhibit the possibility of having an ADC. Based upon our research, we suggest the following: Ask for a sign that your relative or friend continues to exist. Pray for him or her and others who are affected by the death, including yourself. We recommend that you learn how to meditate, especially if you are currently bereaved or have unresolved grief. Meditation will enable you to relax and soften any fear or anger you may have. It will reduce your depression, improve your ability to eat and sleep, and facilitate your healing process. These deep relaxation exercises will also allow you to unfold your inner, intuitive senses. In fact, you may have an ADC experience while you are meditating. Our research indicates that after-death communications are a natural and normal part of life. Therefore, we feel ADCs deserve the same public awareness and acceptance that near-death experiences (NDEs) have already received. For most people, an after-death communication from a deceased family member or friend is valued as a sacred and profound experience that will be cherished for a lifetime. ADC experiences usually expand one’s understanding of life and offer a deeper awareness of life after death. They consistently communicate an essential spiritual message: "Life and love are eternal." Happy annivery to my mother Lucia Olalde Flores from all of us and who is with my neice Sherrie.We miss you mother and Sherrie,may god bless your sweet hearts. from Ernest Olalde Flores and Mike Flores.